What makes a strategic developer? Or to put it another way, what makes the role of a developer strategic? This was the theme of very thought provoking session where there was no coding but a lot of talking at dev8ed last week. Led by Amber Thomas (JISC), Mahendra Mahey (UKOLN) and Ben Ryan (Jorum), the session started with Mahendra giving an overview of the JISC funded DevCSI</a project which is actively engaging and supporting educational developers through events such as dev8ed and the well established dev8D. It’s an old cliche that developers don’t get or aren’t allowed out much, and a large part of DevCSI is to provide increased opportunities for developers to ‘get out’, share and learn from peers. As well as running these events Mahendra and colleagues have also been conducting a range of activities around the impact and value of developers including commissioning case studies and a stakeholder survey. The findings of the survey have shown that the institutional value of developers varies greatly, and more importantly that there is recognition of the strategic value of developers. But how often are developers seen as being strategic in an institutional context? Like many others, they are often pretty far down the strategic food chain. Of course there are exceptions to every rule and as was pointed out there are a few “super developers” who are involved in strategic planning and know the business process of their institution and are recognised as such. I think particularly in teaching and learning contexts the developers often aren’t as recognised as they could be. They are often seen as been slightly apart from the educational developers/academics who are much further up the institutional food chain than the “techies”. Of course, developers aren’t alone in that respect, as was brought up in the discussion learning technologists and librarians have all suffered the same issues. As the discussions unfolded I was also reflecting on the the recent Curriculum Design programme meeting, where there was uniformed agreement on the difficulty of identifying the key strategic roles for institutional change to occur. The PALET project, has described the key stakeholders needed to implement change processes as “worker bees” and I think developers often fall into this category. They actually do things that allow other changes to be build on and from but are often not the first (or event the last) names /roles that jump to mind when stakeholder groups are being formed. The issue of management and PDP for developers was central to the discussion, with a range of contexts being shared including examples from some institutions where developers are at the heart of strategic development and actively participate in teaching and learning committees and the craft/apprenticeship model Joss Winn has been actively promoting. There was also discussion around the pros and cons of project management techniques. There was much “nodding of heads” when the point was made that the waterfall method actually stopped communication between developers and end users/clients; and equal agreement that agile methodology whilst great for communication between developers (especially paired programming) it wasn’t that great at really addressing wider communication issues. And communication is, imho, at the heart of the problem. If technology in education is to continue to evolve then all parts of the community need to be sharing developments, aspirations and possibilities. Yes, developer specific events such as dev8D are needed, but I would like to see dev8ed evolve into a space where more there was an equal mix of developers and non developers, where the more teaching and learning focused participants could come up with ideas and work with developers to realise them. That way the strategic role of developers could begin to get more traction from a bottom up approach, and more shared understandings of needs from multiple stakeholders could be begin to be addressed. It was a really useful session and it is going to be followed up not only by the work outlined earlier by Mahendra and colleagues but also in a workshop at this year’s ALT-C Conference being organised by Amber Thomas. 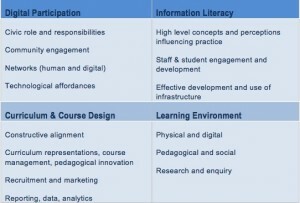 As part of the the JISC Developing Digital Literacies programme held yesterday (15th May), Helen Beetham (synthesis consultant for the programme), started the day by giving a very useful summary of key issues and themes emerging from the baseline reports from both the projects and the professional associations associated with the programme. Most of the day was spent in group discussion sharing experiences around a number of aspects relating to the development of digital literacies. Summary notes from each of the sessions will also be available from the Design Studio over the coming week. But in the meantime, I’ve pulled together some tweets from the day to give a flavour of the day. Those of you who regularly read this blog, will (hopefully) have noticed lots of mentions and links to the Design Studio. Originally built as a place to share outputs from the JISC Curriculum Design and Delivery Programmes, it is now being extended to include ouputs from a number of other JISC funded programmes. The Transforming Assessment and Feedback area of the Design Studio now has a series of pages which form a hub for existing and emergent work on assessment and feedback of significant interest. Under a series of themes, you can explore what this community currently know about enhancing assessment and feedback practice with technology, find links to resources and keep up to date with outputs from the Assessment and Feedback and other current JISC programmes. This is a dynamic set of resources that will be updated as the programme progresses. Follow this link to explore more.